You’ve probably heard the rumors and all about the special event that Apple will hold today. Well it’s here. The event will start at 10 am Pacific time. Most of the time, Apple doesn’t stream their events live but today is different. First they made it available for Apple TV owners to watch Live simply by turning it on and selecting the “Apple Events” app that magically appears on the menu.But why stop there? 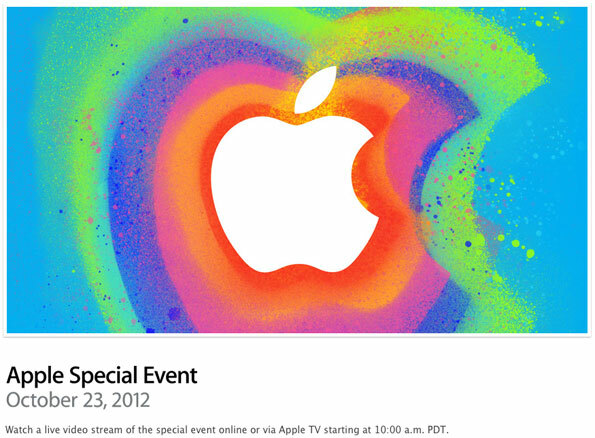 Apple has now made the iPad Mini Event available to watch from their website. In the past, Apple fans have been disappointed not being able to watch live streams of media events. The only way was to watch live blogs or wait until the video was posted on Apple’s site afterwards. Most of the time we have an idea of what to expect, but you know how Apple likes to run a tight ship. Over the last few weeks it seems inevitable that we will see an iPad Mini with a 7.85 inch screen to help compete against the Nexus 7 and the Kindle products. With the iPad Mini coming out, look for it to replace the iPad 2. With that you can expect a refreshed iPad with the possibility of a Lightning port and maybe some other minor upgrades. The 15 inch Retina Macbook Pro was such a big hit that now is as good of a time as any to roll out a 13 inch. To an average shopper and with the holiday seasons right around the corner, a lower priced Retina Macbook should be debuted. The iMac hasn’t been updated in over a year and the Mac Mini is overdue for a change. We could see a slimmer iMac and a refreshed Mini with USB 3.0 along with faster processors and internal specs. Don’t expect to see a Retina display on the iMac. With the costs, it’s highly unlikely. Apple previewed a New iTunes at the iPhone 5 event, but it hasn’t arrived yet. Since iOS 6 is out and their promised time of “October”, it makes sense to see iTunes 11 announced with these product refreshes for the year.